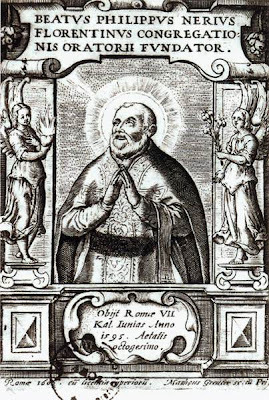 Father Gregorio Ozes, the Dominican, declared that before he entered religion he also saw Philip raised in the air and with a resplendent light around him; and F Francesco Maria Tarugi, that he had beheld him raised a palm above his bed when the Saint was praying once for Tarugi's deliverance from a temptation of sloth, which immediately left him. These occurrences were not confined to private places or witnessed only by a few; even in churches and public places the Saint was carried away against his will into ecstasies. On one occasion he was praying in St Peter's at the tombs of the Apostles, when his whole body was seen to rise suddenly into the air, with his clothes gathered up as they had been when he was kneeling, and then to descend with equal suddenness; after which, fearing that he might have been observed, he fled away with the utmost rapidity. The same thing happened in many other churches, so that when he entered a church in company with others, he used to stay a very little time, only saying a Pater and Ave and then rising from his knees, to prevent the possibility of his going into an ecstasy.